According to a Google Chrome commit, a higher-resolution Chrome logo is needed "to look crisp and pretty on our secret upcoming 4K Chromebooks." While this breaks any veil of secrecy covering the arrival of these Chrome OS devices, there is still no launch date to talk about. The idea behind Chromebooks is to provide a long battery life and enough processing power for office and light multimedia tasks, so 4K displays were out of the question until now. 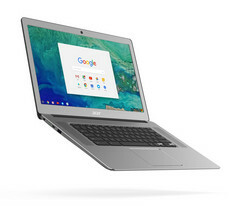 Obviously, spreadsheets can look better in 4K than in 1080p, but the increased computing resources and battery capacity needed to use such a high resolution would lead to a rather high price, something that was also not in the cards when Google teamed up with Acer and Samsung to release the first Chromebooks. The recently released Google Pixelbook shows that this area of the market now also has a premium sector, so it is only a matter of time until the first 4K Chromebook becomes available. While this is nothing else but a speculation, the following commit for Google Chrome is not: "The current Chrome logo (uploaded in CL:331831) is slightly oval for some unclear reason. This patch replaces it with the image currently used for the boot splash screen which is presumably officially sanctioned. As an added bonus, this logo is not only much rounder but also higher resolution, making sure it will continue to look crisp and pretty on our secret upcoming 4K Chromebooks." The quote above leaves no room for debate: the 4K Chromebooks are coming. Obviously, there are still a lot of questions that remain, but those concern the manufacturer(s) who will get in the 4K Chromebook game first, the timing of the releases, or the technical solutions they will choose. Will we have a 4K touchscreen Chromebook first? Will we get a compact convertible or a 17.3-inch behemoth before anything else? Once somebody can provide at least 10 hours of autonomy in a Chromebook that is portable enough and features a 4K display we should have all the answers, but until that happens, we can only wait.